ATLANTA — Design Interactive Inc, providers of augmented and virtual reality (AR/VR) training solutions for fleet maintenance personnel, vendors and OEMs, said here at the Technology & Maintenance Council (TMC) Annual Meeting & Transportation Technology Exhibition that its Augmentor transportation focused, augmented reality training solution is now available on Android and iOS mobile devices. 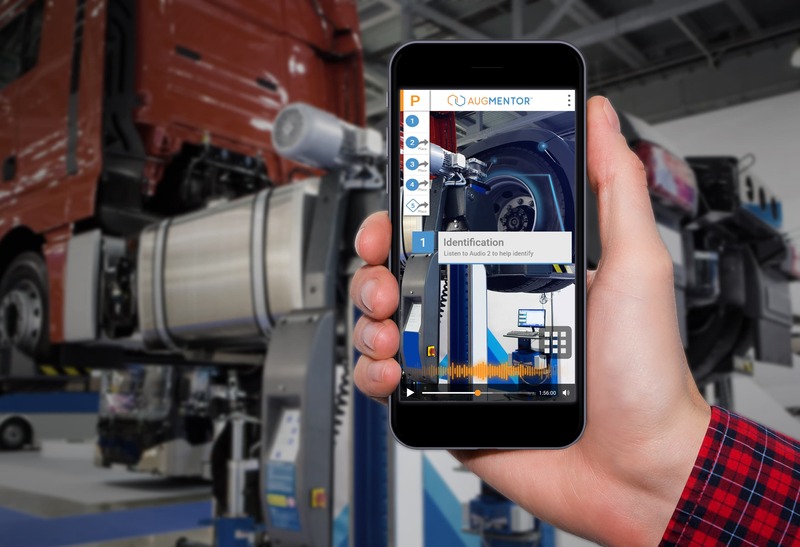 The new mobile applications for Augmentor include an augmented reality mode that lets technicians visualize procedure steps where they are conducted. For example, if a vehicle requires an inspection of its tires or brakes, the step is placed near or on that component or system. Users can also see 3D virtual representations of parts for reference during inspection or repairs. The mobile app also includes videos, audio messages and text instruction. For fleets, Johnston said Augmentor helps lower training, labor and parts costs, and increases vehicle uptime and shop productivity. Especially as new technologies continue increasing the complexity of the repairs, tools and skills needed by technicians, the transportation-focused solution ensures training consistency by enabling access to updated content. Design Interactive Inc (DII) develops and deploys augmented, virtual and mixed reality training and enterprise solutions for the transportation, medical, aerospace, manufacturing, and energy/oil/gas markets, as well the military. Design Interactive’s extensive research and development expertise in using augmented and virtual reality technologies delivers innovative solutions that keep people safe, improve efficiency, and achieve optimum performance. Founded in 1998 and based in Orlando, Florida, Design Interactive is a woman-owned business. For more information, visit www.designinteractive.net.